Kimble's Corner: Congressman Kimble Calls Madison "Our Valley Forge Moment"
Congressman Kimble Calls Madison "Our Valley Forge Moment"
It has long been said by patriots that it is in enduring great hardship that we reach into our reserves of individual liberty, and from those reserves is our greatness as a people born. Today, in Madison, Wisconsin I witnessed such hardship and the cold chill of Wisconsin did not beat us back, it only tempered our resolve until it became as steel. 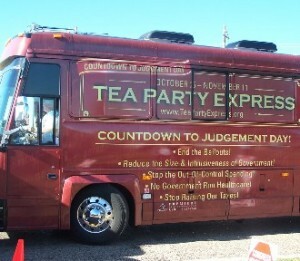 Much as Cortes burned his own boats before conquering the savage Aztecs, the brave Tea Partiers who came here from Virginia saw the Koch Brothers order the buses to drive away after everybody was off so that none would be tempted to flee from confrontation with union thuggery. We huddled for warmth and support as we advanced through the blizzard that Madison was experiencing. We were joined by 6 hearty souls from Wisconsin. Here I met Leo who at 82 years young was able to pepper me with memories of his childhood when his father used a club to disperse strikers during the 1935 Lindemann Strike. He believed in the cause so much he came out himself though he was far too old and frail to wield the ancient piece of wood he showed us. We began protesting, but were soon driven inside by the howling winds. We gathered at a local Denny's where we faced our first adversity. My chicken noodle soup was tepid and watery and I was not alone, but driven by our patriotism, we would not let this break us. Emboldened by our respite, we build a snow Obama, but found our heart wasn't in it. Cold, we none the less marched forward to the capital, where Joe the Plumber and Andrew Breitbart had just spoken yesterday and I led our brave patriots in a recitation of the Pledge of Allegiance before saying a few words myself. After, spending the evening at the George Webb, I made my way to the Howard Johnson's where I had reserved a room. The hotel was kind enough to let the other protesters wait in the lobby as they shivered and waited for the Koch Brothers buses to return. We should have worn heavier coats, but we came, we persevered, and we made our voices heard for freedom. This was our Valley Forge moment and it is one I shall not soon forget. Yer lucky all you got was tepid soup brought to you by the wait staff. I wouldn't have been so kind and not added anything to it. Oh and you might want to get into the habit of maybe Yelping for information on local business. Madison has not had George Webb for a while now. Hope this helps.